“One employee equals one desk.” This was the conventional office organization method until very recently. But today’s space efficient work environment and the millennial’s appreciation of flexible work schedules have broken this paradigm. Companies are shifting to dynamic hoteling and hot desking of workstations, dramatically reducing office real estate costs and allowing greater flexibility. Find out what this new trend is all about, how it helps companies save real estate costs, and what is absolutely necessary to make it work without chaos and time wasting. Millennials, the generation born between the early 1980s and the early 2000s, will soon make up the majority of the workforce, and they are changing the traditional workplace. 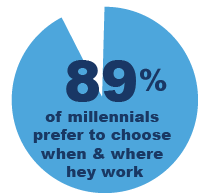 89% of millennials prefer to choose when and where they work rather than being placed in a nine-to-five job. They occasionally work from home and spend more time telecommuting. They also like to collaborate with coworkers and have frequent meetings with colleagues and clients. 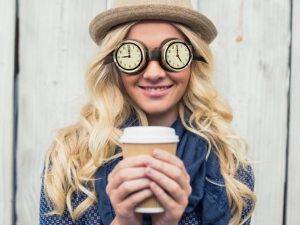 As a result, millennials typically spend just 40% of their time at their desks. This means that most employees don’t need permanently assigned workstations, and personal workspaces can shrink 30–40%, saving expensive office space. But to realize these savings, companies need to replace the traditional method of permanently assigned seating with hoteling or hot desking of workstations, the dynamic assignment of workstations to employees. For decades, corporates moved their campuses to office parks in the suburbs and employees followed. Now corporates are moving the other direction, returning to city centers and downtowns. The reason – tech-oriented millennials are clustered in city centers and corporates want to be where they can attract young talent. However, real-estate expenses are much higher in city centers, requiring greater cost efficiency in office space utilization. Moving away from the paradigm of one desk per one employee is the key to space optimization. Space utilization is a challenge for companies of all sizes. Real estate costs in urban areas are constantly rising, making real estate one of the top three expenses for a typical company. Traditionally when workstations were assigned to a single employee, there was no real room for space efficiency. If you had 1000 employees, you needed 1000 workstations plus around 300 more to accommodate growth. These are 300 wasted workstations in a year. In addition, from the 1000 workstations, if you count the ones that are empty because the employee is sick, traveling or working from home, the number of utilized workstations can be much higher. Luckily, millennials are used to unassigned workstations and they prefer a flexible work environment that allows them to sometimes work remotely, over being tied down to a desk from nine to five. Therefore, if managed correctly, one workstation can accommodate multiple employees. For example, if one workstation can accommodate four employees throughout the week, we need a bit more than 250 workstations to accommodate the existing workforce of 1000 employees (say around 350 workstations). 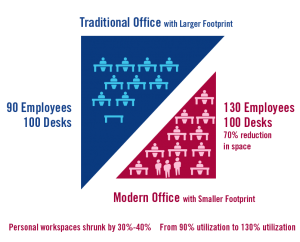 If we take into account 125 more workstations to accommodate growth, we reach a total of 475 workstations instead of 1300, which is almost 70% savings. However, these potential savings might be completely wasted if employees spend a considerable amount of time every day just trying to find an available workstation. If an employee needs to come in and look for an empty workstation, it creates wasted time and frustration. Assuming this inefficiency takes anywhere between 15 minutes to half an hour, for a campus with 1000 employees, these are 500 hours that are wasted for nothing, leading to chaos. This experience also affects the amount of times that employees would want to come in to the office. If it is an unwelcoming, frustrating experience they will end up coming less. 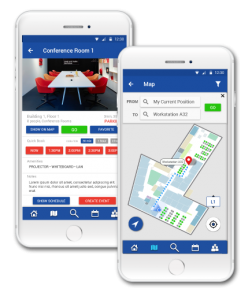 Adding hoteling, hot desking and indoor navigation features to the Employee App platform can prevent this chaos and improve productivity. With hoteling, employees reserve a workspace before they come to the office. When employees plan to come to the office, they can check workstation availability in a desired time slot, view available workstations on a map or a list and reserve a workspace or a meeting place in advance. Alternatively, with hot desking employees find an unassigned workstation upon arrival to the office, without advanced reservation. 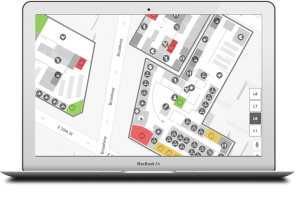 If they are already in the office, they can find the closest unclaimed workspace and navigate to it in real-time. The booking of workstations can be done on the mobile app, desktop, or kiosks that are strategically placed throughout the facility. This can save a considerable amount of time and provide a frictionless experience to employees, increasing their productivity and satisfaction. If a large-size meeting room is constantly used by small groups, it can be split up into a number of smaller rooms. If some workstations are never booked by employees, their location can be repurposed as a meeting space or recreation space. If one employee comes in on Mondays and Wednesdays and anther on Tuesdays and Thursdays, they can both use a single workstation. This optimization can be done on an hourly base as well. By understanding the ratio between workstations and employees for each department, facility manager can even accommodate growth without renting additional space, as multiple employees will be using the same workstation. By now you probably agree that hoteling and hot desking can significantly reduce real estate costs, especially in expensive city center offices. Yet to prevent chaos and inefficiency, hoteling and hot desking must be combined with indoor location technologies that provide facility managers with critical occupancy and utilization analytics as well as allow employees seamless booking of workspaces and real time indoor navigation.